Moments after city workers removed the black tarp, protesters re-covered the statue with a plastic sheet. Only a few hours after being covered up, the statue of Edward Cornwallis has already been unveiled. 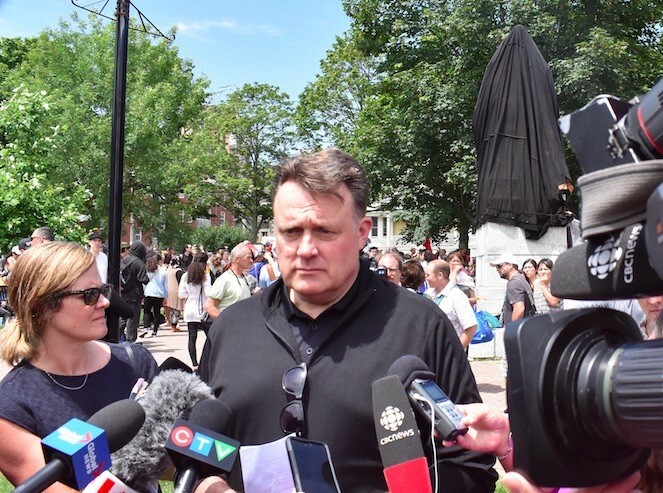 Municipal workers, under orders from mayor Mike Savage, draped the controversial monument with a black tarp during a protest early Saturday afternoon. It was a compromise from municipal officials hoping to keep the peace as nearly 300 people gathered in the city’s south end in anticipation of toppling the bronze sculpture. “I’m not suggesting the organizers wanted to have a violent demonstration, but there was concern based on some posts and some social media and other reaction that this could turn out to be not what the organizers wanted or what we wanted,” Savage told reporters. 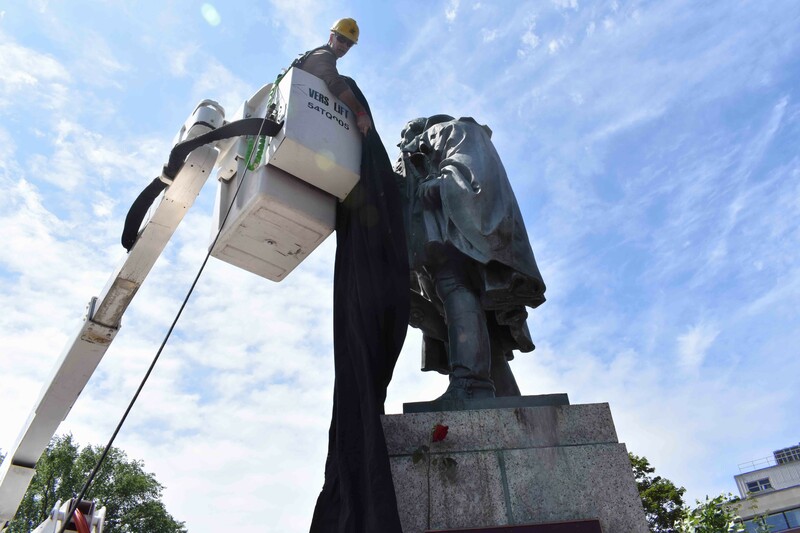 A municipal worker drapes the statue of Edward Cornwallis on Saturday. After a prayer ceremony from Mi’kmaw elder Isabelle Knockwood, the tarp was lowered to cheers and raised fists from the crowd. Afterward, those assembled participated in a round dance to traditional Mi’kmaw drumming and song. Fewer than three hours later, the tarp had already been removed. The former governor of Nova Scotia founded the city of Halifax in 1749, in violation of existing treaties with Indigenous peoples. The same year, Cornwallis issued a bounty for Mi’kmaw scalps. 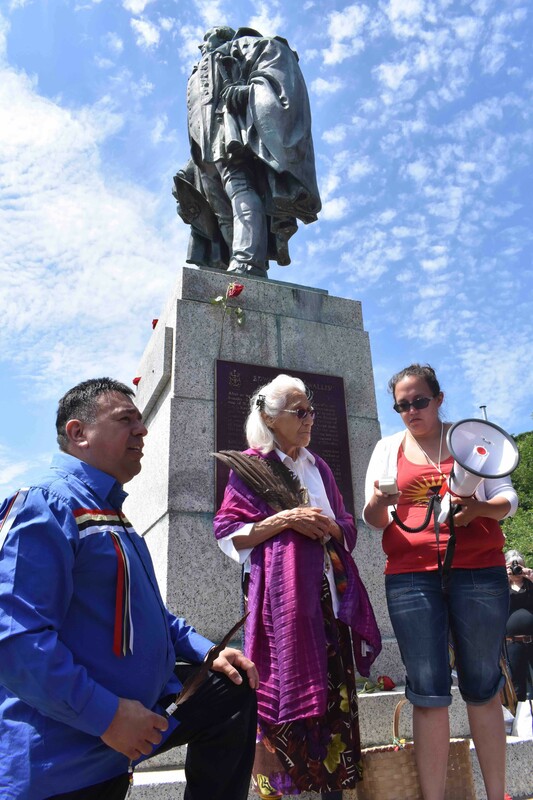 Chief Morley Googoo, Mi'kmaw elder Isabelle Knockwood and event organizer Suzanne Patles stand beneath the statue. His statue has in recent years become a lightning rod for Halifax’s reconciliation efforts with the Mi’kmaq people—or lack thereof. Saturday’s protest was the latest civic action, organized in response to the disruption of an Indigenous ceremony on Canada Day by members of the Proud Boys alt-right frat. Speaking to reporters after the ceremony, Knockwood said she understood the tarp was only a temporary measure but hoped it would be a means of education about the area’s history. “I want it to symbolize mourning, a period of mourning, for all those who died as a result of the wars, as a result of the scalping order,” she said. 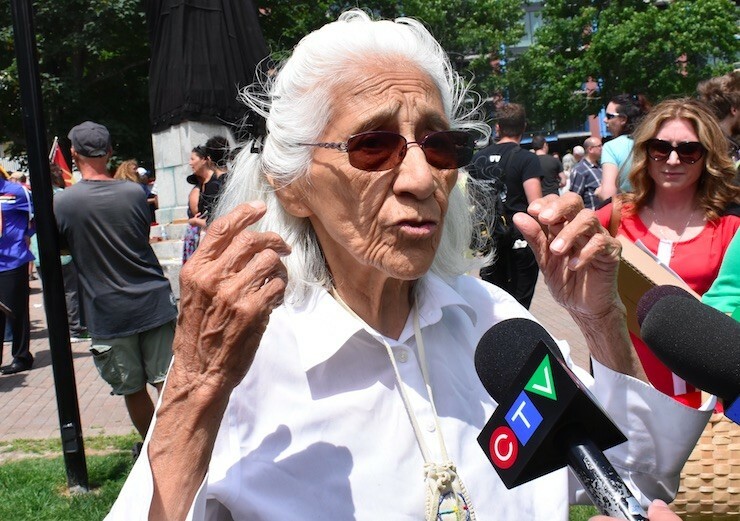 “A crowd like this, it’s a very spiritual place today,” said Isabelle Knockwood, a residential school survivor. 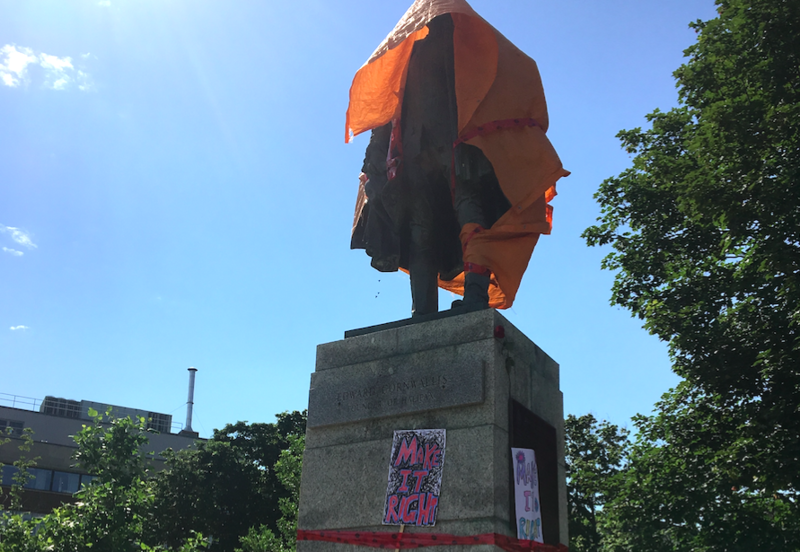 Earlier in the day, organizers presented mayor Savage with a call to action to immediately remove the statue, host a peace assembly to facilitate reconciliation and create an Indigenous-Halifax expert panel to ensure the naming of public parks and assets is respectful towards First Nations peoples. Savage promised he’d present the document to city council at its Tuesday meeting but admitted he wasn’t sure if all the actions could be met. “I don’t want to make a promise in the face of potential protest,” the mayor said. Mayor Mike Savage addresses media. Council voted back in April to form an expert panel and examine how the city commemorates its founder. The members of that panel won’t even be assembled until at least September, and a timeline for when it will report back to city hall is very much still up in the air. The organizers of Saturday’s protest asked HRM to report back to them on their call to action in time for Mi’kmaq History Month in October. Although there’s no legal holdout stopping council from voting to remove the statue right now, Savage said the municipality has to continue examining the issue fully, from all perspectives, if the situation is ever going to be permanently resolved. “There are a number of people who very strongly do not want the statue down,” Savage said. Likening the issue to LGBT rights, the mayor said many of his former colleagues in Parliament used to be opposed to gay marriage, but have now come around to support those causes. A similar slow-but-steady march towards progress will be needed, Savage says, to determine the final fate of Edward Cornwallis’ statue. City hall and Assembly of Chiefs quiet on Wilbert Marshall’s past and his potential involvement in eagerly anticipated Halifax committee.